>> News >> Eganville News >> Eganville Rocks! The Ottawa Valley has some of the oldest rock in the world in our Canadian shield and deposited on top of that over 450 million years ago was sea mud which is now the Limestone outcroppings you see scattered amongst the shield’s Granite that is everywhere around Eganville. These are the top 7 sites you have to visit alone or with friends and family to get a true appreciation of the “Stories of our Earth” that abound in and around Eganville. The Bonnechere Caves – guided tours suitable for all ages go all summer long through this post glacial cave system formed in limestone from the Ordovician Time Period. Glacial Erratic – situated at the traffic lights in downtown Eganville this Erratic was deposited over 10,000 years ago for us to marvel at. Fossil Rock Wall – this artificial feature also situated in the downtown contains hundreds of invertebrate fossils from the Ordovician Time Period. Look for them or just enjoy the climb. Bonnechere Museum – situated at the traffic lights the museum is open for visitors all summer long. Learn about the geology of the area and also our community’s history. 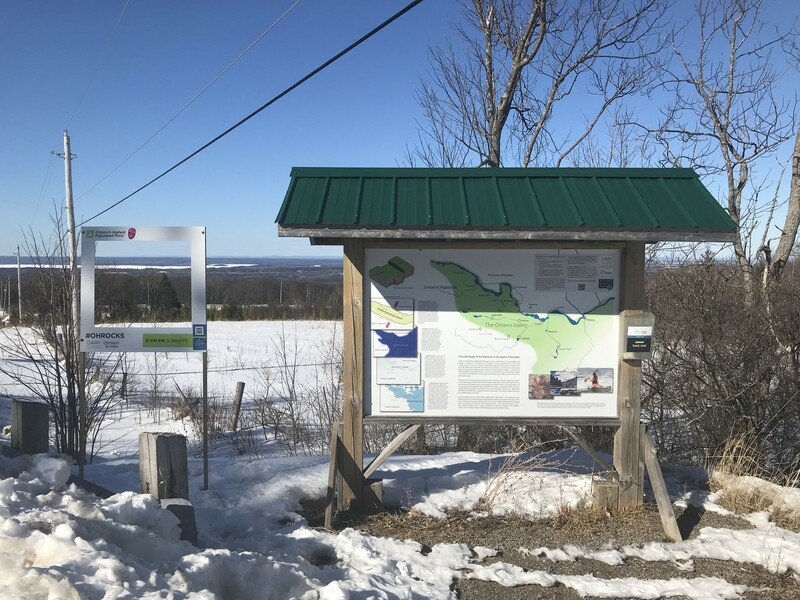 Fossil Hunt Geology Trail – located by the lower bridge in Eganville on John Street this site allows collectors the chance to find an invertebrate fossil. Monument to honor survivors of sexual violence - made of the many shades of ancient Ottawa Valley granite each stone was placed by over 250 people to create North America’s first monument to recognize survivors of sexual violence. Eganville Rocks!Tour de Bonnechere has become a major Ottawa Valley event!